Hi I am Surendar Reddy from Andhra Pradesh. It was my fourth company which I was attending. And it was a good experience too. Some 60 to 70 students attended it initially. These are the interview rounds:. 2. GD (if more no.of students got through 1st round). Consisted of 30 questions for 45 minutes. Included questions from quantitative aptitude (ages, Relationships, series, one or two questions which required to use areas of geometrical figures, Some very few questions on distance, speed as far as I remember). Also had technical questions. Questions based on algorithms. So be prepared with commonly Asked n used sorting and searching algorithms. Then questions to write output of code snippet Given. All are objective questions. There was verbal section also. Arranging sentences in sequence to make a correct paragraph. Filling up the blank with correct word given in option. Some few synonyms and antonyms. Major point to care is the management of time. One has to workout all apti questions and make. Sure that they maintain proper time for questions before attending interview. Questions are of medium level of toughness. So one has to practice well on time management. If this round is cleared then chances are there that you may proceed well with other rounds as. You’ll be generally asked questions on your interest. Many got filtered in this round. 20 students got selected in 2nd round. But as company people were running out of time, they Conducted GD for selected last 10 students. My name was in top 10 students list, I didn’t face GD. I entered directly into this round. The interviewer welcomed me into interview room with warm Greeting. Asked how d day was n asked me to tell me some thing about myself. I spoke for about 5 mins. By that time, he glanced through my resume. Asked some questions from C and C++ as I said that those were my favorite programming languages. Questions were simple, like Pointers and difference between C and C++ from coder’s point of view and not from textual Knowledge. Some questions on networks and commands which we use for command Processors. (these were asked as I’ve mentioned them in my resume). Then he asked me about projects done in very detail. This round lasted for 20mins approx. It was like any normal HR round. Questions like-Tell me some thing about yourself, do you know any Thing about fidelity, hobbies (asked in detail) , some questions from projects done and any problems faced while doing projects, strenght and weakness and how do you overcome it, are You ready to relocate etc. Lasted for some 10 to 15 mins. Fidelity Investments is an American multinational financial services corporation. It is one of the largest mutual fund and financial services groups in the world. Founded in 1946, the company has since served North American investors. Fidelity Ventures is its venture capital arm. 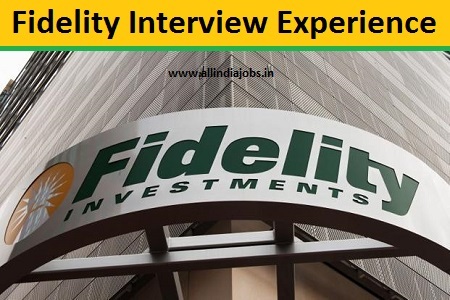 Fidelity International Limited (FIL), was an affiliate founded in 1969, serving international markets and the rest of the world; FIL was spun off as an independent business in 1980, and has since been rebranded as ‘Fidelity Worldwide Investment’.